Synchronous operation mode supports two AWG615 outputs (2: analog, 4: marker) synchronization for high data rate wireless and data communication test and optical write channel strategy signal test. The AWG615 Arbitrary Waveform Generator Delivers World-class Signal Fidelity at 2.7 GS/s to Solve Ever-increasing Measurement Challenges. New two box synchronous operation function supports 2ch 2.7 GS/s solution. The AWG615 combines world-class signal fidelity with high-speed mixed signal simulation, a powerful sequencing capability and graphical user interface with flexible waveform editor, to solve the toughest measurement challenges in the disk drive, communications and semiconductor design/test industries. The built-in signal applications enable you to easily create standard waveforms for disk drive read channels, communications up to 2.7 Gb/s. Also included is AXW100 ArbExpress waveform creation and editing software. 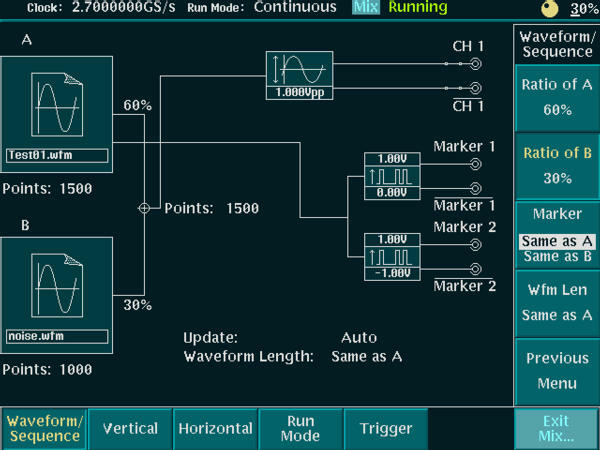 This software allows for easy waveform import from oscilloscopes or basic, advanced, and math waveform creation and edit capabilities. Waveform Length - 960 to 32,400,000 points (or 64,800,000 points, option 01) in multiples of four. Sequence Length - 1 to 8,000 steps. Sequence Repeat Counter - 1 to 65,536 or infinite. Continuous - Waveform is iteratively output. If a sequence is defined, the sequence order and repeat functions are applied. Triggered - Waveform is output only once when an external, internal, GPIB, LAN, or manual trigger is received. Gated - Waveform begins output when gate is true and resets to beginning when false. Enhanced - Waveform is output as defined by the sequence. Waveform Shape - Sine, Triangle, Square, Ramp, Pulse, or DC. Frequency - 1.000 Hz to 270.0 MHz. DC Level - DC waveform only. Range: 0.1% to 99.9%, Pulse waveform only. 1.000 Hz to 4.000 MHz: 0.1% step. 4.001 MHz to 20.00 MHz: 0.5% step. 20.01 MHz to 40.00 MHz: 1% step. 40.01 MHz to 80.00 MHz: 2% step. 80.01 MHz to 100.0 MHz: 2.5% step. 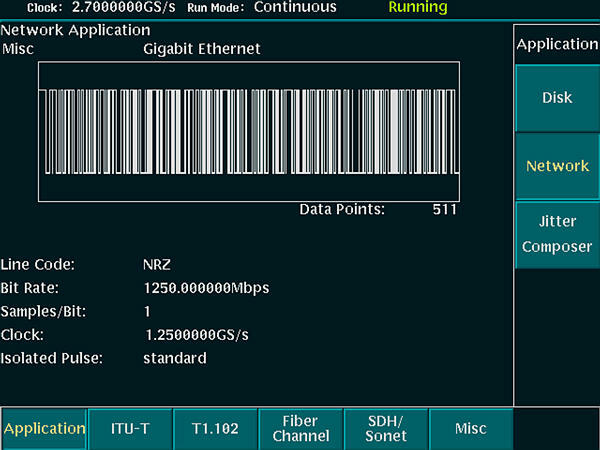 100.1 MHz to 160.00 MHz: 4% step. 160.1 MHz to 200.0 MHz: 5% step. 200.1 MHz to 270.0 MHz: 10% step. Hi Lo: 20% / 80% of Period. Hi/Lo: 50% / 50% of Period, except 100.1 MHz to 160.0 MHz. Hi/Lo: 52% / 48% of Period, at 100.1 MHz to 160.0 MHz. Waveform mixing operation - Supports two-signals mixed output digitally. Synchronous operation - Supports synchronization of two AWG615 boxes allowing two synchronized signal outputs. NOTE: This operation is executed by Sync master and Sync slave operation combination. Sampling Frequency - 50.000000 kS/s to 2.7000000 GS/s. Internal Clock - Accuracy: ±1 ppm. At 2.7 GS/s, 10 kHz offset: -58 dBc/Hz. At 2.7 GS/s, 100 kHz offset: -93 dBc/Hz. Range: 1.0 μs to 10.0 s.
Resolution: 3 digits, 0.1 µs minimum. Output Signal - Complementary; CH1 and channel inverse. Output Connector - Front Panel SMA. Amplitude - Into 50 Ω.
Amplitude Range: 20 mV to 2.0 V peak to peak. DC Accuracy: ±(2.0% of Amplitude + 2 mV) at offset = 0 V.
Offset - Into 50 Ω. Range of Signal Center: ±0.500V (Rails of -1.5V, +1.5V). Accuracy: ±1.5% of offset ±10 mV at 20 mV amplitude. Pulse response - (-1 and 1 waveform data, 0 V offset, through filter at 1 Vp-p, clock 1 GS/s) using 20 GHz BW oscilloscope. Rise time: (10 to 90%): ≤480 ps. Fall time: (10 to 90%): ≤480 ps. Aberrations: ±10% (at 1.0 Vp-p amplitude). Flatness: ±5% (after 20 ns from rise/fall edge). Harmonics: ≤-40 dBc, DC to 1000 MHz. Noise: ≤-50 dBc, DC to 1000 MHz. Phase noise: ≤-85 dBc/Hz at 10 kHz offset. Type - 20, 50, 100, 200 MHz Bessel low-pass. Rise Time (10% to 90%) - 20 MHz, 17 ns; 50 MHz, 7.0 ns; 100 MHz, 3.7 ns; 200 MHz, 2.0 ns. Group Delay - 20 MHz, 18 ns; 50 MHz, 8 ns; 100 MHz, 4.7 ns; 200 MHz, 3 ns. Amplitude - 20 mVp-p to 1.0 Vp-p into 50 Ω.
DC Accuracy - ±(2% of Amplitude + 2 mV). DC Offset Accuracy - 0 V ±10 mV at 20 mV amplitude (waveform data = 0). Rise Time (10% to 90%): ≤280 ps. Fall Time (10% to 90%): ≤280 ps. Output Impedance - 50 Ω. *1 Option 02 eliminates the ability to switch between normal and direct D/A out, as well as filter and offset control. DC Accuracy - ±(2.0% of amplitude + 2 mV). DC Offset Accuracy - 0 V ±10 mV at 500 mV Amplitude (waveform data = 0). Pulse Response - (-1 and 1 waveform data, at 1.0 Vp-p). Rise Time - (10% to 90%): ≤175 ps. Fall Time - (10% to 90%): ≤175 ps. High level: -1.00 V to 2.45 V into 50 Ω to GND. Low level: -2.00 V to 2.40 V into 50 Ω to GND. Amplitude: 0.05 Vp-p to 1.25 Vp-p max. into 50 Ω to GND. DC Accuracy - Within ±0.1 V ±5% of setting into 50 Ω.
Rise/Fall Time (20% to 80%) - <130 ps into 50 Ω to GND (1.0 Vp-p, Hi +1.0 V, Lo 0 V). At 2.7 GS/s 2.1 ps rms, 15 ps peak to peak. At 1.35 GS/s 2.1 ps rms, 15 ps peak to peak. At 0.675 GS/s 2.0 ps rms, 14 ps peak to peak. Cycle-to-Cycle Jitter (Typical) - by1010 clock pattern. At 2.7 GS/s 3.6 ps rms, 26 ps peak to peak. At 1.35 GS/s 3.6 ps rms, 26 ps peak to peak. At 0.675 GS/s 3.3 ps rms, 23 ps peak to peak. Marker Skew - < 20 ps (typical). Amplitude - CML, AC coupling, 0.4 Vp-p into 50 Ω to GND. Impedance: 50 Ω, AC coupling. Amplitude - 1.2 Vp-p into 50 Ω. Max 2.5 Vp-p open. Impedance - 50Ω, AC coupling. Trigger Mode - Minimum Pulse Width: 10 ns, 0.2 V amplitude. Impedance - 1 kΩ or 50 Ω.
Polarity - POS or NEG. Level: -5.0 V to 5.0 V.
One box operation: ≤109.5 clocks + 500 ns. Two boxes synchronous operation: ≤109.5 clocks + 700 ns. Delay to Analog Out: 275.5 clocks + 17 ns (Normal Output, Filter "Through"). Minimum Pulse Width (0.2 V amplitude): 1152 clocks + 10 ns. Gate Hold Off: ≤1920 clocks + 20 ns. Delay to Analog Out: 1355 to 1563.5 clocks + 9 ns (Normal Output, Filter "Through"). Input Signals: 7 event bits, strobe. Maximum Input: 0 V to +5 V (DC + peak AC). Impedance 1 kΩ, pull-up to +3.3 V.
Minimum Pulse Width: 320 clocks + 10 ns. Event Hold Off: ≤ 896 clocks + 20 ns. Strobe: ON, 1691.5 clocks + 10 ns. Strobe: OFF, 1947.5 clocks + 6 ns. Setup Time: 192 clocks + 10 ns. Hold Time: 192 clocks + 10 ns. Impedance - 50 Ω, AC coupled. Input Voltage Range - 0.2 Vp-p to 3.0 Vp-p, ±10 V maximum. Frequency Range - 10 MHz ±0.1 MHz. For 2 boxes synchronous usage. Display - Color TFT LCD. Internal Hard Disk - ≥20.0 GB. Flash Disk - 256 MB (Option 10). Floppy Disk - 3.5 inch, 1.44 MB. Operating: 10 °C to +40 °C. Nonoperating: -20 °C to +60 °C. Operating: Up to 3,000 m (10,000 ft). Nonoperating: up to 12,000 m (40,000 ft). Operating: 2.65 m/s2rms (0.27 Grms, 5 Hz to 500 Hz, 10 minutes. Nonoperating: 22.36 m/s2rms (2.28 Grms, 5 Hz to 500 Hz, 10 minutes. Shock - Nonoperating: 294 m/s2 (30 G), half-sine, 11 ms duration (three times each axis, in each direction, 18 total). EMC Compliance - EC Council Directive 89/336/EEC (EC-92), AS/NZS2064-1/ 2. Safety - UL 61010B-1, CSA C22.2 No. 1010.1, EN61010-1 second edition. Rating - 100 to 240 VAC. Range - 90 to 250 VAC. Maximum Power and Current - 240 VA and 5 A. Frequency - 48 to 63 Hz. Interfaces - GPIB, Ethernet: 10/100Base-T, RJ-45. PC Keyboard - 6-Pin mini-DIN, rear.